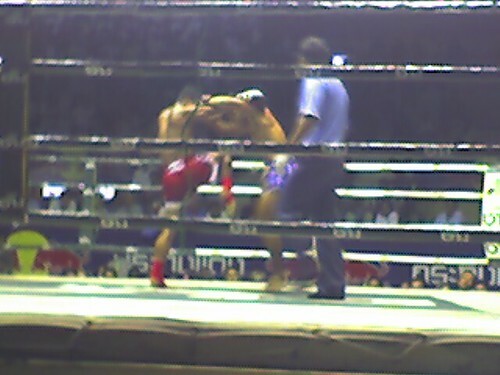 I remembered why I don't like to watch boxing matches: The sweat streaming down the boxers' bodies while they fight, trainers rubbing sweat into their boxer's muscles during every break, sweat flying into the crowd as one boxer gets in a big punch. I don't even mind people hitting each other, just don't show me all the sweat! It's gross! 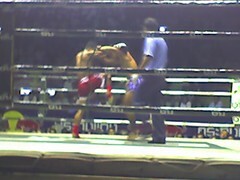 Lee wanted to be sure to see Thai boxing, so here we are. We just had some yummy street food outside the arena, and now we're sitting in the foreigners section ringside. There are other travellers to meet here as we listen to the drums and crowds cheer during each round. We all seem to be guessing at the rules and scoring, and cringing at the blood spurting from the head of the boxer in the red corner. It's a cool scene to see the crowd so excited and the drink and numbers runners scurrying through the rows. It's really loud. I'll be surveying the crowd more as the rounds go on...avoiding the visions of sweat splashing on the ropes.